In 1946, Walter O’Malley began his quest to find a solution for aging Ebbets Field in Brooklyn. Parking at Ebbets Field was limited to just 700 cars in the scattered lots around the ballpark. In 1912, in Leslie’s, The People’s Weekly, Dodger owner Charles Ebbets wrote, “I want to build a structure that will fill all demands upon it for the next thirty years.”“Why I Am Building a Baseball Stadium”, Charles Ebbets, President Brooklyn Baseball Club, Leslie’s, The People’s Weekly, April 4, 1912 Coincidentally, that would take the steel, brick and cement stadium to the end of its life expectancy at about the time O’Malley started searching for solutions. O’Malley wanted to privately finance, design, build and maintain a new stadium for the Dodgers in Brooklyn. He was seeking assistance in assembling land, which he would pay for, in order to privately build a dome stadium at his preferred location at the intersection of Atlantic and Flatbush Avenues. On October 14, 1946, O’Malley writes a letter to renowned designer-engineer Captain Emil Praeger of Madigan & Hyland in Long Island City, New York, “Your fertile imagination should have some ideas about enlarging or replacing our present stadium (Ebbets Field).”O’Malley archive, Walter O’Malley letter (copy) to Capt. Emil Praeger, October 14, 1946 However, after a study completed by designer Norman Bel Geddes in 1948, it was determined that renovating Ebbets Field made neither economic nor practical sense, as parking would still be lacking. As the 10-year effort went forward, O’Malley worked with New York City Mayor Robert Wagner, Brooklyn Borough President John Cashmore, a government-created Brooklyn Sports Center Authority signed into law in Brooklyn by New York Governor Averell Harriman and, of course, Moses. With dwindling attendance at Ebbets Field and the Milwaukee Braves’ ascent in attendance and success on the field, O’Malley took action on several fronts. He played some home games in 1956 and 1957 at Jersey City, New Jersey’s Roosevelt Stadium. He sold Ebbets Field in the fall of 1956 and arranged to lease it back for three years (plus two option years through 1961) until a new stadium could be built and he sold his ballpark in Montreal (Triple-A) to raise capital for land and construction costs for a new stadium. When it was evident that the only site that Moses was willing to recommend was in Flushing Meadows, Queens, O’Malley had to consider leaving Brooklyn for that site and weighing that against other options. Only when acquiring land at his preferred site in Brooklyn was no longer a possibility did O’Malley consider Los Angeles as an option. O’Malley had been in Los Angeles on just three brief occasions. For many years, Los Angeles desired to become a “big league” city in sports and was vigorously trying to attract a Major League Baseball team. In May 1957, the National League gave unanimous consent for the Dodgers and the New York Giants to move to Los Angeles and San Francisco, respectively, but the two clubs had to move together before October 1, 1957. Horace Stoneham and the Giants announced they were moving to San Francisco on August 19, 1957. O’Malley fought to the end to try to remain in Brooklyn. 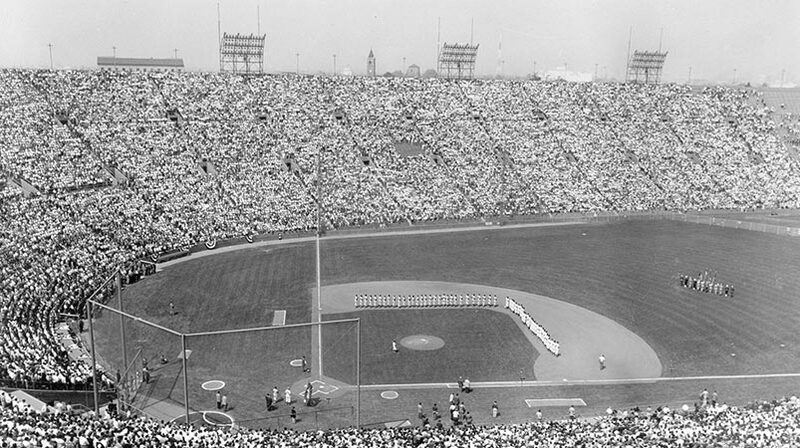 On October 8, 1957, it was announced that the Dodgers were going to relocate to Los Angeles. Beginning in 1946, Dodger owner Walter O’Malley’s sole focus was to find a solution to aging Ebbets Field and to keep the Dodgers playing in a new stadium located in Brooklyn. During his unprecedented 10-year effort to remain in Brooklyn and to privately build a new stadium for the Dodgers to replace Ebbets Field and its limited parking for 700 cars, O’Malley stated repeatedly that he was not asking the city to build him a new stadium. He was seeking assistance in assembling land, which he would pay for, in order to privately build a new ballpark – a domed stadium – at his preferred location at the intersection of Atlantic and Flatbush Avenues in Brooklyn. On October 14, 1946, O’Malley writes a letter to renowned designer-engineer Capt. Emil Praeger of Madigan & Hyland in Long Island City, New York stating, “Your fertile imagination should have some ideas about enlarging or replacing our present stadium (Ebbets Field).” However, after a study was completed by designer Norman Bel Geddes in 1948, it was determined that renovating Ebbets Field made neither economic nor practical sense, since parking would still be lacking. More than 10 potential stadium sites were considered before O’Malley concentrated on the intersection of Atlantic and Flatbush Avenues. He preferred this site as all modes of transportation converged there, including subways and the Long Island Railroad. An outdated meat market was on the site, in a congested area in need of rehabilitation, which the domed stadium with plentiful parking would have provided. On May 24, 1954, O’Malley shows his disapproval of a new five percent admissions tax to be placed on tickets sold at Ebbets Field and warns the tax on amusements would be adverse to the city’s interests. O’Malley’s telegram to New York City Mayor Robert Wagner stated, “You should not do anything to force baseball (from New York) to other cities. You know what the municipal authorities of Baltimore and Milwaukee have done to attract and maintain major league franchises. Los Angeles, Dallas, Havana, Montreal, Toronto, Kansas City and the twin cities of St. Paul-Minneapolis are ready to put money on the barrel head to get a major league baseball franchise. Against this competition our city is going in reverse.” Despite his plea, the plan passed on tickets to all New York amusements, costing the Dodgers $165,000 annually. On October 30, 1956, New York real estate investor Marvin Kratter pays $3 million to the Dodgers to purchase Ebbets Field in Brooklyn and arranges to lease it back for three years (plus two option years through 1961) from Kratter’s assignee, Tillie Feldman. On May 16, 1957, Abe Stark, president of the New York City Council, proposes Ebbets Field site to be rebuilt to accommodate 50,000 and parking for 5,000 through the acquisition of adjacent land. His proposal was rejected by O’Malley and Moses. On May 28, 1957, National League owners, meeting in Chicago, voted unanimously to grant the New York Giants and the Dodgers permission to move to San Francisco and Los Angeles, respectively, with the requirement that the two clubs must move together before October 1, 1957. The next day, New York Mayor Wagner requested a meeting with O’Malley and Giants’ owner Horace Stoneham. Responding to charges that O’Malley was playing New York against Los Angeles for the purposes of going to the highest bidder, he explained, “It is a very simple situation, Mr. Chairman. I started out in 1947 trying to get a new ball park for the Brooklyn Dodgers in Brooklyn. We hired an engineer, we conferred with our civic officials, and made very serious studies of various sites. “It developed that at that time the way could not be found to condemn land to assemble a plot large enough, and, of course, the ball club very properly does not have the legal right to condemn land. But it was hoped that there was enough of a public purpose in the activities surrounding a ball club, particularly if it could be tied in with other things of civic importance such as the relocation of a meat market. The meat market men said that if they were relocated, they could bring the price of meat down 5 cents a pound in Brooklyn. That seemed to be a pretty good civic proposition. There was a traffic intersection of Atlantic and Flatbush which is a very bad one, and some day it is going to be cured. “That, too, becomes part of a civic purpose in trying to assemble the land at Atlantic and Flatbush. Then there is a question of parking in that area of our community where our department stores are located. Some parking facilities were needed in that area. There was also the observation that the property for the most part was substandard, and had been so designated by Mr. (Robert) Moses as subject to a study for slum clearance. On September 10, 1957, O’Malley writes an internal memorandum regarding the Brooklyn Stadium. “Mr. Mylod’s Brooklyn Sports Center Authority is to come up for consideration before the Board of Estimate on September 18th. Mr. Mylod and I are concerned about a letter that Commissioner Robert Moses wrote to Peter Campbell Brown dated I believe August 28, 1957, in which Commissioner Moses kills the Atlantic & Flatbush Avenue site and persists in making a play for the Flushing Meadow site in Queens. This is a further bit of sabotage which together with the recent quotes of Abe Stark, City Council President, indicates that there is no sincere administration desire to work out a solution here in Brooklyn. Walter F. O’Malley.” The same day, a story breaks on Nelson Rockefeller’s interest in keeping the Dodgers in New York. On September 18, 1957, O’Malley, New York Mayor Wagner and financier-philanthropist Rockefeller meet at Gracie Mansion to discuss Rockefeller’s proposal to keep the Dodgers in New York. Rockefeller originally planned to purchase for $1.5 million the property that the city would then condemn in downtown Brooklyn. Madigan and Hyland engineering firm had placed the cost of condemning the land at $8 million. Later, Rockefeller’s offer grew to $2 million and then to $3 million. In effect, the $3 million would be a loan to the Dodgers with interest and the acquisition of 12 acres in order to build a stadium. On October 7, 1957, the Los Angeles City Council adopts Ordinance #110,204 officially asking the Brooklyn Dodgers to relocate to Los Angeles and bind the city by contract with the Dodgers. The contract obligated O’Malley and the Dodgers to build and privately finance a 50,000-seat stadium; develop a youth recreation center on the land at half a million dollars, plus annual maintenance payments for 20 years of $60,000; plus pay property taxes on land that had not generated any in years (initially $345,000 in 1962). Also, O’Malley and the Dodgers would transfer team-owned Wrigley Field in Los Angeles, then appraised at $2.2 million, to the city. The Los Angeles Angels of the American League used Wrigley Field for home games in 1961.